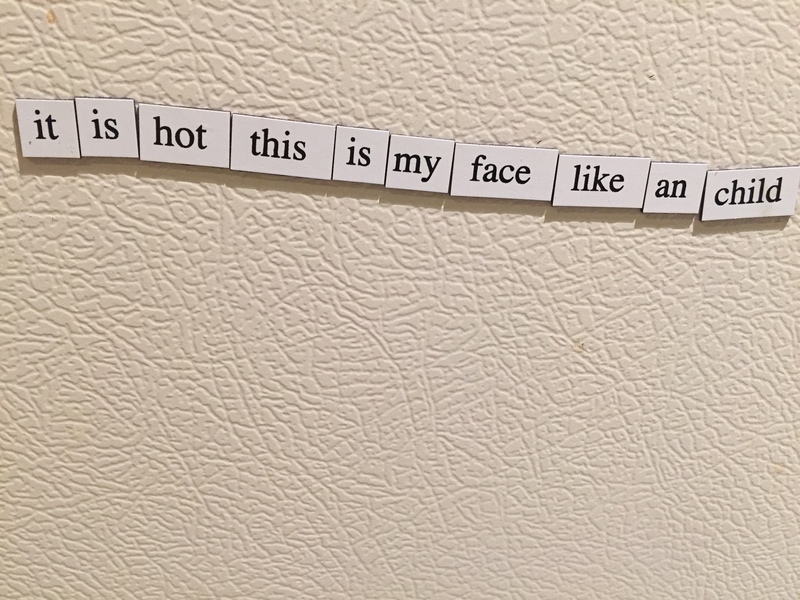 A young person was at my house the other day devoting a great deal of attention to the words that live on my refrigerator. I have unfortunately ceased to see these words–that’s what happens with words, you get used to them, take them for granted, stop working at the relationship. Seeing her kneel in front of the words and arrange them so lovingly was a blow to my conscience. As penance I assisted her with locating the sundry conjunctions and prepositions she requested, handing them to her like scalpels to a surgeon. Earlier in the day we’d trudged through mud to chop down a tree and bring it back to my house and festoon it with entirely unnecessary decorations. 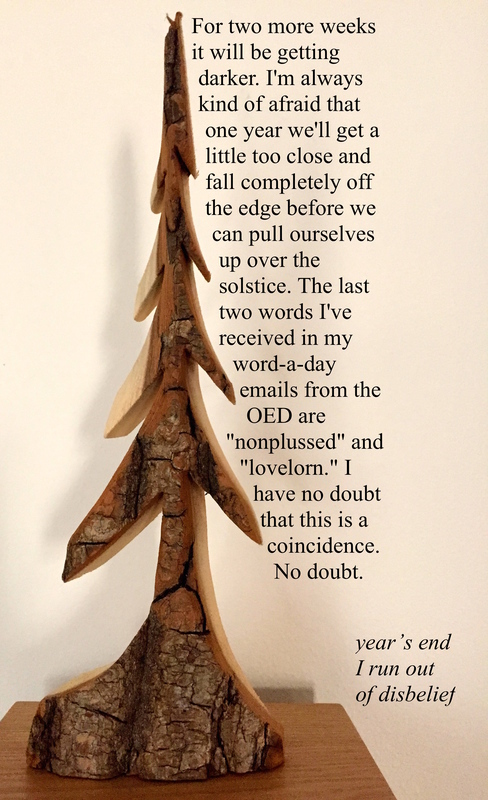 Sometimes this is how writing feels to me, an unnecessary festooning, except then I remember the part about the tree being both lovely and comforting and how in the dead of winter, in the dark of winter, it doesn’t actually feel unnecessary. One of the greatest obstacles to writing well is the necessity of simultaneously forgetting everything you ever knew about language and remembering everything you know about language. It’s the complicated business of being every age you’ve ever been all at once, knowing and unknowing all the things you’ve ever been ignorant of and then learned. It’s a strange trick you have to play with your mind and it doesn’t work, not often, not well, not for most of us. Knowing and forgetting, dreaming and being aware. I think it can sometimes work better for children because they have learned less and forgotten more. But that might be my romanticism speaking. Or my continual yearning for beginner’s mind. So for your reading pleasure, a new issue of Haibun Today is out. I was first published in HT nearly four years ago when I didn’t really know what haibun were but thought they sounded cool so maybe I’d try to write some. 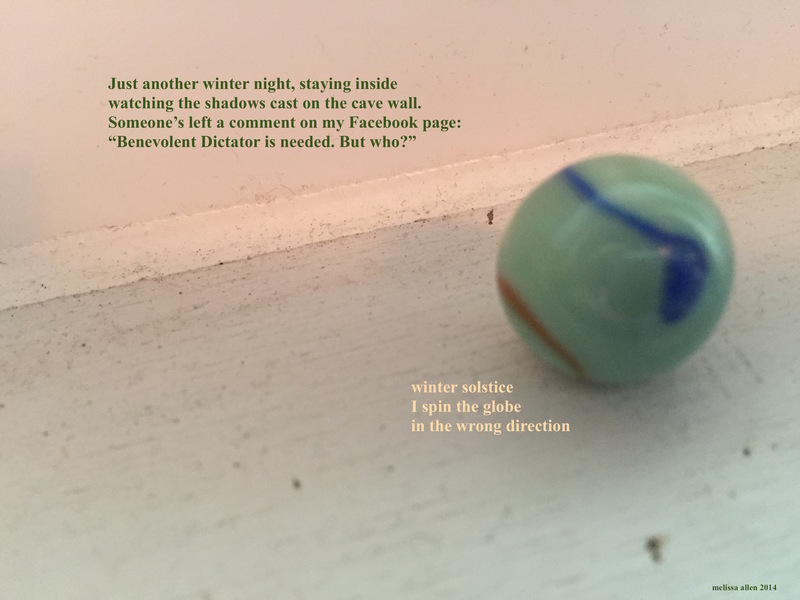 I have a new haibun in the current issue (it’s called Polar Vortex! ), and also I have an editor’s biography, because thrillingly, I am now one of four haibun editors that rock the house over at HT. We’re each editing one issue a year, and I’m up for the next (March) issue. Here’s the submissions page because I know you want to write a bunch of haibun and send them to me to read. You have until Jan. 30, so ready, set, go. If you’re wondering what my personal editorial philosophy is, here’s something I wrote about the matter for HT when I was the haibun editor at Multiverses (a journal that sadly lasted only one issue and is no longer available on the web). You have to scroll down a bit to get to me, though it’s worth it to read what all the other editors have to say. Okay. Enough about me. On to you and the thrilling haibun you’re going to write, the things you’re going to say that no one else could say in a way that no one else could say them. And then I get to read them. What a great gig.